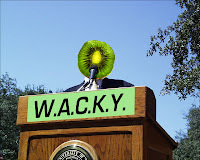 The Jack Sack™: Kiwi Fruit Organization protests "24"
Kiwi Fruit Organization protests "24"
On Tuesday, the World Alliance for the Cultivation of Kiwis and Yams (WACKY) issued a terse statement in protest of "24's" apparent misrepresentation of kiwi fruit onscreen. In part, WACKY stated "The mishandling of kiwi fruit by the show's producers and writers only serves to foment further kiwi-hatred within America. The show even went so far to implicate a kiwi fruit in the murder of a former U.S. President." Specifically, there is a scene in Monday's episode where former First Lady Martha Logan throws a kiwi at her ex-husband and in a flurry of activity that soon followed, Charles ends up with a knife in his shoulder. While video playback shows Martha stabbing Charles, it is not clear if the kiwi fruit was holding Charles down while this happened. Many viewers believe the kiwi was working with Martha. 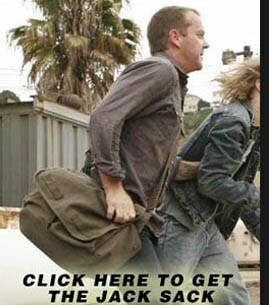 WACKY cites nationwide riots at kiwi fruit stands all week as being a direct result of "24" and its portrayal of the fuzzy, squishy fruit. Standing in solidarity with its kiwi brethren are the Yams of America. Yams, who have been fighting their own battle in recent years to politically distinguish themselves from their more controversial cousins, the Sweet Potatoes, reaffirmed their dedication to peaceful protests. "Every Thanksgiving, we have to mount our own campaign to undo the misinformation spread about our group. We know how it feels to be unfairly associated with rotten fruits and vegetables. We're here to tell this country that kiwi fruit are non-violent. No American kiwi would ever try to assassinate a former leader of this great country." Despite their efforts, pictures often carry greater weight than the spoken word. And the image of a kiwi violently attacking a former president is too difficult to ignore. One anonymous kiwi told us "They should be having parades for us, we killed one of the worst men to ever lead this country." And it's quotes like that which make us doubt the kiwis public declarations of peace. Editor's Note: This article, also appearing in Blogs4Bauer, was written with the aid of NyQuil Cherry Flavor moonshine- err medication! And we thought 24 only drove Muslim groups crazy! And in other news, terrorist mastermind Khaleid Sheikh Mohammed has confessed to masterminding the assassination of David Palmer. This is in addition to his confessed involvement in 9/11, Richard Reid's attempted shoe bombing, a plot to blow up Big Ben, the Kennedy assassination, the Lindbergh baby kidnapping, faking the moon landing, and the death of Anna Nicole Smith. Leave it to Mrs Aaron Pierce to turn a kiwi fruit into a lethal weapon! 300 Spartans against one million kiwi fruit... I say, the battle would have been swift and bloody. Kiwi are mroe dangerous than you all realize. THE CARNIVAL OF BAUER: WHAC-A-MOLE EDITION! We're LiveBlogging at Blogs4Bauer tonight!!! They're like steak and eggs! The Logan Bris: A "24" Picture Book!